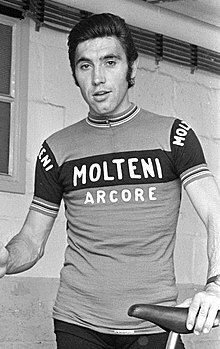 Edouard Louis Joseph, Baron Merckx (Dutch pronunciation: [ˈmɛrks]) (born 17 Juin 1945), better kent as Eddy Merckx, is a Belgian umwhile professional road an track bicycle racer. ↑ Suze Clemitson (4 April 2014). "Remembering how Eddy Merckx won at home in the 1969 Tour of Flanders". The Guardian. Guardian Media Group. Archived frae the oreeginal on 10 May 2015. Retrieved 10 May 2015. This page wis last eeditit on 21 Mey 2016, at 23:08.